Craving something light, bright, and refreshing? 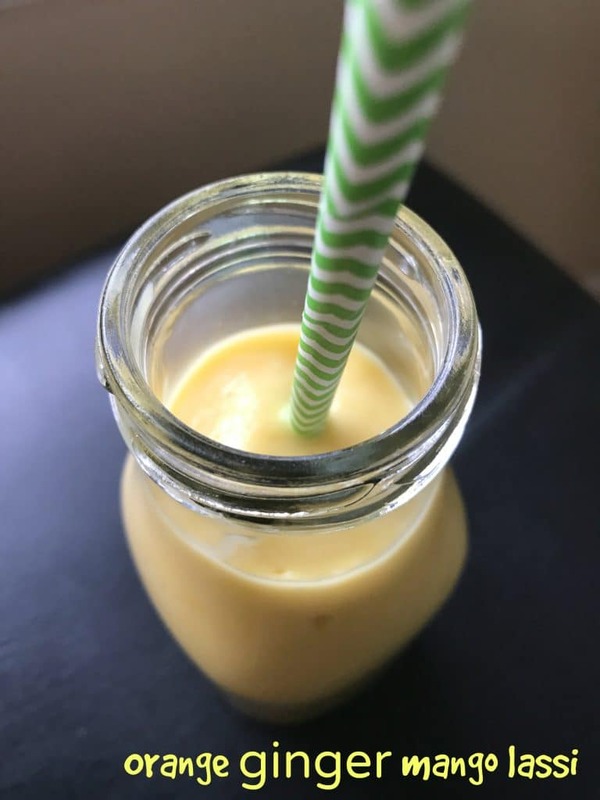 This orange ginger mango lassi will be a huge hit – a perfect drink to have with your favorite Indian meal – or a healthy treat to enjoy for breakfast or dessert. Orange Ginger Mango Lassi – You Need This. Baby K and I had a takeout Indian lunch date with my favorite mamas the other day and all I wanted was a mango lassi. For the past few weeks, all of us have had sick kid after sick kid. Spring, where are you? I just want to bathe in vitamin C and ginger to get me through these illness-prone weeks. Power Up. Don’t bathe in vitamin C, just put it in your mango lassi. Instead of bathing in citrus and ginger, I highly recommend you just put it in your drink. A traditional mango lassi is really just mango, honey, plain yogurt, and ice. 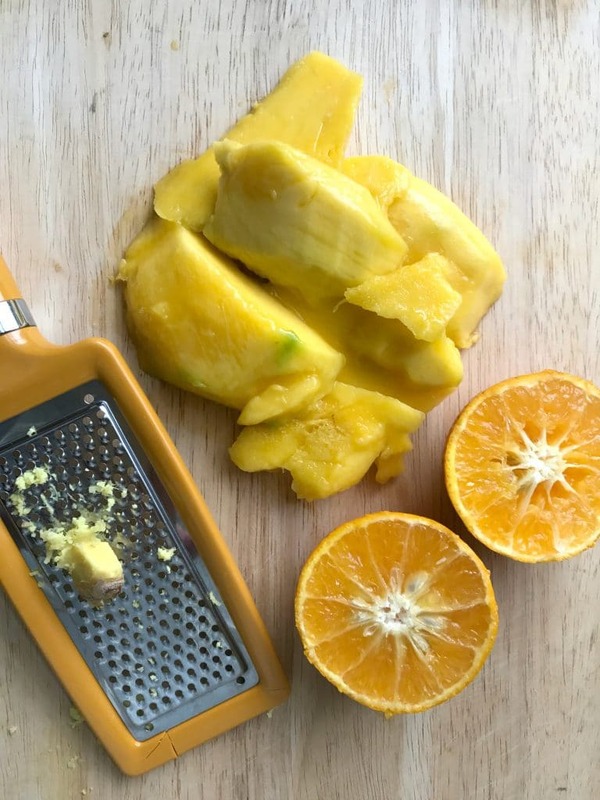 Add an extra punch and help your immune system by adding freshly squeezed orange juice and grated ginger. Use whatever yogurt you have on hand. I prefer a tart, unsweetened yogurt. We used coconut yogurt this week and no honey, and this smoothie was easily transformed into a vegan treat. It’s awesome. I promise. You can’t mess it up. My only advice … if your mangoes aren’t ripe, your smoothie might not be the smoothest. When I made orange ginger mango lassis with my kids earlier in the week, our mangoes were SO RIPE! Our lassi was super smooth. When we made a huge pitcher of orange mango lassis for lunch later in the week, it was tricky finding enough RIPE mangoes. If you have frozen mango chunks on hand, use those! I found myself near a Trader Joe’s this afternoon and grabbed a couple bags of their frozen mango chunks. Fresh fruit is great, but let me tell you how much work you will save yourself if you’ve got prepared mango on hand! Orange Ginger Mango Lassi – Enjoy! 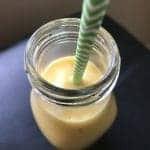 This orange ginger mango lassi will be a huge hit! Combine ingredients in a blender - ice first. Blend until smooth! RIPE mangoes work best. Cheers!! Orange Ginger Mango Lassi. Delicious!